A rosette is a decorative, flower-like treatment that can engraved on any round shape. 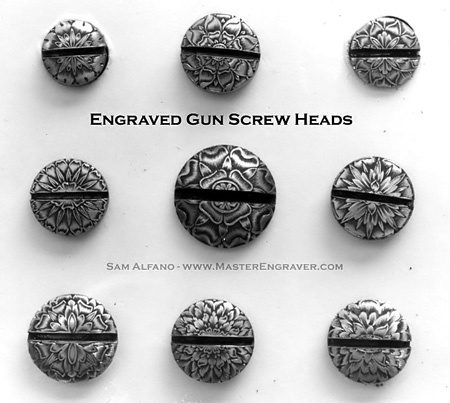 On elaborately engraved guns, rosette screw heads add beautiful detail that enhances the look and value of the finished project. 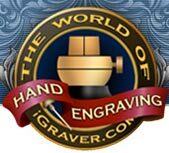 While the designs appear complicated, they are not that difficult to engrave once you learn the techniques of layout. 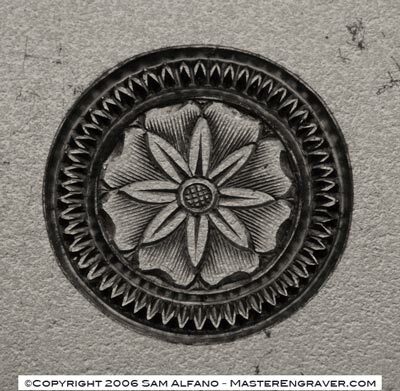 The accompanying file download includes instructions on engraving a basic rosette. Using that technique, different leaves and flowers can be substituted for varied and more intricate design. The examples below show nine different screw heads in which no two are alike. Rosettes are also useful in jewelry engraving applications. 1/2" (12mm) rosette with decorative border. Download the rosette pdf file. Engraved by hammer & chisel and hand gravers in the early 1980's during my tenure with New Orleans Arms Co.